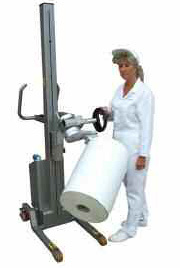 Ideally suited for clean room environments, the Stainless Steel Compac range of Reel Handling, Roll Handling, Barrel and Drum Lifting and Handling Equipment from One Stop Handling Ireland is proving to be a winner in industries as wide ranging and diverse as Electronic,Computer, Packaging, Food, Drinks, Chemical, Medical & Pharmaceutical. Literally all industries. The purpose-designed compact framework, positioning of handlebars and addition of an optional remote control device provide improved manoeuvrability and ease of use for the operator. Incredibly small footprint makes the Compac Mk5 Reel or Roll Lifting machine highly manoeuvrable and a natural choice for today’s narrow production lines and demanding lifting requirements. Taking account of the latest health and safety standards and EU directives, additional safety features have been incorporated to further protect operating personnel and satisfy the increasing demands of insurance companies. 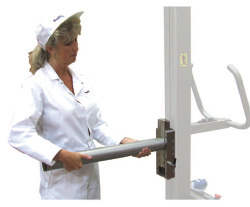 Designed to lift, transport and position loads, the Compac has been the name associated with top quality,reliable, stainless steel lifters for many years; and the latest model, the Mk5 has been developed following extensive market research into the lifting and handling needs of today’s modern production environment.The Compac is flexible in design, ergonomic, operator friendly, easy to use, and, with its range of features and functionality it meets the needs of today’s lifting requirements. Primarily manufactured from stainless steel, the Mk5 Compac is ideal for industries where hygiene and resistance to chemicals is of paramount importance including Food and Dairy,Medical, Chemical, Pharmaceutical and Cosmetic. With a small footprint and easy operation, the Compac can be used in the confined work spaces and narrow production lines found in many of today’s modern manufacturing environments. Available in three standard models with maximum lifting capacities of 60kg, 150kg, and 300kg, along with a variety of frame configurations and a comprehensive range of interchangeable attachments, makes the Compac an ideal choice for most lifting applications. 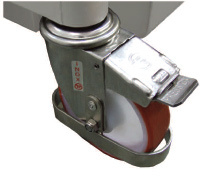 The Compac is powered by 12v dc battery operated system with the carriage lift being generated from a motor driven precision ballscrew, eliminating the need to use any hydraulics and consequent risk of oil leaks. Untitled-1Engineered and tested to our own exacting quality standards and using only fully approved components, the Compac has been designed to provide a low maintenance, reliable machine that has been built to last. 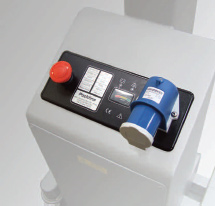 Considering operator safety at all times, the Compac has been designed to meet the latest international Health & Safety directives, CE approved with supporting risk assessment, technical files and documentation.